Home Television	Mr. Robot S2.E1 – What is real? Does it Matter? The two-part season two premiere of Mr. Robot on USA Network picks up a month after the fsociety attacks on Evil Corp that brought financial chaos to the world. It also starts with a few flashbacks. Elliot and Tyrell at the arcade on the night the attack starts, just before Tyrell disappears. Also, a flashback to the day that Elliot’s dad pushed him out of the window when he was a child. As the episode settles in, we find Elliot living with his mother. He has constructed a strict routine to try to keep him sane. Daily meals at the same place and time with a friend, watching basketball at the park, household chores, bible study group and journaling. Elliot describes this as his analog existence. Like an addict, he is putting all his effort into avoiding his demon, the digital world. All under the watchful eye, and cynical monologs, of Mr. Robot. Elliot thinks that if he can stay, as he describes it, sane long enough then Mr. Robot will fade away. But, when Elliot Meets Craig Robinson’s Ray at one of the basketball games it triggers a Mr. Robot takeover. Ray asks Elliot for some computer help, and it turns out that Elliot then meets with Ray, but Elliot has no memory of it. Gideon also stops by to see Elliot. Allsafe is gone, Gideon’s marriage is over and Gideon is being set up as a fall guy for the hack. He wants Elliot to confess whatever he knows to the FBI to help clear Gideon. The writers have created an interesting challenge with season two. At the end of last season they reviled that Mr. Robot was Elliot’s dad and a manifestation in Elliot’s mind. 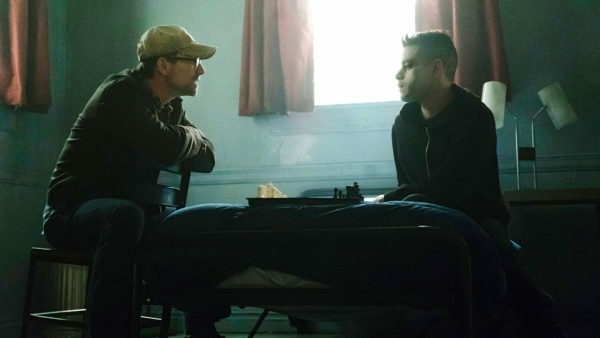 Elliot wasn’t a reluctant participant in fsociety, but the mastermind. The show created the menace of Mr. Robot as chief among the digital robin hoods. But, now we know he isn’t a real separate person, so how will he be a compelling force in the show? I think they are doing it in two clever ways. One, Mr. Robot is keeping the secret of what happened with Tyrell. So Elliot must fight with his own mind to find what he did. Two, they are raising the question of who is real, Elliot or Mr. Robot? They’ve already established Elliot as an unreliable narrator, so we are never quite sure if reality lines up with what we are seeing. The rest of fsociety seems to be coasting on the success of the 5/9 attacks. They cut the balls of the bull statue on Wall Street. They take over the smart home of E Corp’s chief council and set up base there. Elliot’s sister Darlene looks to be the head of the movement now. She is trying to quell a party atmosphere and figure out if they have only won a battle but are losing the war. E Corp is hurt, the system is beat-up, but not down. They need to do more, so they turn to parlor tricks and viral theater. fsociety takes E Corp’s bank system hostage with ransomware and demand $5.9 million. They demand someone from the company take the cash to a park, pile-it up and burn it. Viral theater, with no real point or consequences for society’s chosen villain. I’ve always had a problem with the grand plan. The eradication of American citizens’ debts, the chains that hold people to faceless corporations, may be a noble cause. But, they go about it by trying to burn down the forest to save a log cabin. As we see in the scene that begins the ransom hack at Bank of E, the regular people that fsociety thinks they are helping, cannot get to their own money or have access to the proof of ownership they would need to thrive in the utopia fsociety dreams of. It’s just dumb to burn over five million dollars on the street in front of people that would benefit from a bundle of cash in a world where access to their digital money is cut off. fsociety could have been handing out that money like Nino Brown giving the neighborhood turkeys. Along with Ray, played by Craig Robinson, we are introduced to the friendliest deli customer/FBI agent and new fsociety member: Bank of E IT Guy. Angela is still around, having settled into her PR job at E Corp. The episode was a great reboot that sets up an exciting second season.